Obesity Prevention Starts at Home! Were you aware that the likelihood a child struggles with obesity is largely impacted by their home environment? As parents, you set your children up for success or send them down a path of health/weight related struggles. There is so much more to healthy eating than simply knowing the right foods to choose. Think about how many memories you have that involve food. Those memories evoke various emotions. While your children are young and impressionable, you have the opportunity to shape their perception of food. Here are some simple “Do’s” and “Don’ts” to help your child develop healthy food habits. DO make time to have dinner as a family. Spend time catching up, finding out about each other’s day- highs, lows, etc. While you’re at it, be sure to prepare and eat a variety of fruits and veggies. You are a role model to your children. They mimic what you do. DON’T force your child to eat everything on their plate. I vividly remember my mom’s cornbread, ham, and spinach bake. I hated it, but in my house what was for dinner was the only option and that was that. However, rather than force me to finish everything on my plate (if indeed I was truly full and wasn’t scrambling to get out of dinner so that I could eat cereal later) my parents would wrap up my plate and save it for me in the event that I got hungry later. This taught me, first, to appreciate my mom’s hard work in the kitchen. I never expected her to make multiple dinners to please us all, and believe it or not…I grew to enjoy this meal. More importantly, this taught me to recognize true hunger and satiation cues. Forcing your children to eat everything shuts down their sensitivity to Leptin (the hormone the body produces to indicate satiety/fullness) and conditions them to overeat. How many adults do you know who habitually clean their plate at restaurants? You might be one. You push far past the satisfied feeling just because the food is there. Remember, those portions are double (if not more) than a standard serving size! DO encourage your children to participate in the preparation of meals. Incorporate a variety of fruits and veggies. Children take pride in what they create! They’re more inclined to try something new that they took part in making. You have more impact than you realize! If you’ve already been doing these things, great! If you haven’t…start NOW! Always lead by example. Avoid having packaged foods in the house. They provide little, if any, nutrients. Instead, make sure that your refrigerator is stacked with healthy options (carrots and hummus, nuts, fruits, string cheese, yogurt, etc). Your children will eat when they’re hungry. As the parent you control what’s available. 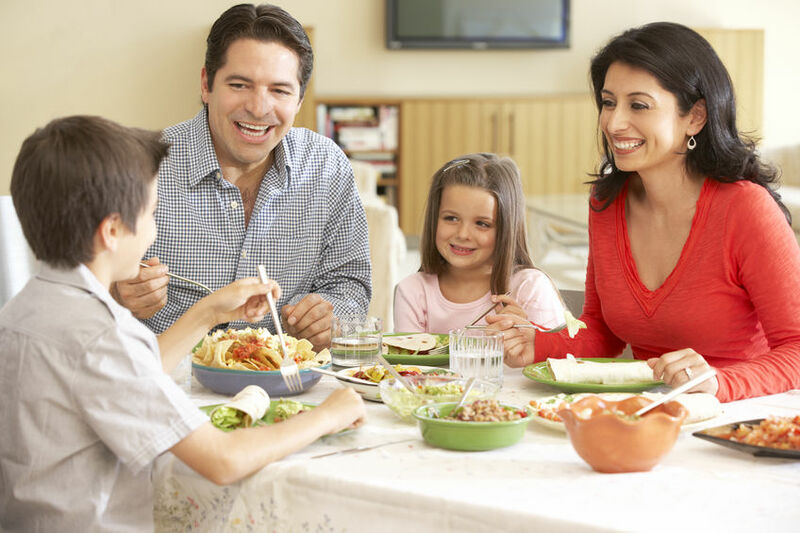 Create healthy habits that as a family your children can carry into adulthood.